Are your parts properly packaged to survive? Or will they need costly rework? 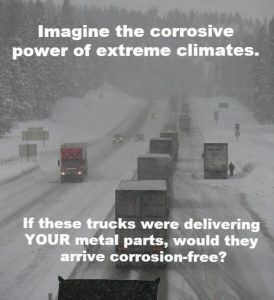 Seasonal changes in temperature and humidity create the perfect environment for corrosion. Our Technical Experts offer valuable industry-focused expertise – from Military & Aerospace or Automotive industries, to Heavy Equipment, Metalworking and Export. Our complimentary global business programs can help you pinpoint problem areas so your metal parts arrive at their destination clean, rust-free and ready to use. Explore our site to learn more about how our VCI corrosion protective packaging works to protect your metal products and reduce your cost of corrosion. Protect your valuable parts and equipment in every season with Daubert Cromwell VCI.